David Marshall is the gym guru behind Lily Allen’s transformation. Now he’s devised a school exercise programme that’s virtually cost free, but will the politicians listen ? Think of a celebrity who has physically transformed him or herself in the past 10 years from fat to thin, slob to sleek, gaunt to gorgeous – and there’s a strong possibility they’ve at some point passed through the hands of David Marshall, the self-styled Bodydoctor: London’s top personal trainer has worked with Meg Mathews and Kate Moss (“she was, ahem, often late”); with Ant and Dec, Sophie Dahl (“from size 18 to 12″), with Myleen Klass and Rachel Weisz. He has trained footballers Joe Cole and Frank Lampard and, rumour has it, their boss Roman Abramovich. It’s also said he’s currently whipping svelteish Lily Allen (down two dress sizes under his tutelage), scrawny Russell Brand and – plush Victoria Wood into shape at his gym in Primrose Hill. But now Marshall has a new, much less glam project afoot. You won’t find the pap outside the gates of Barrow Hill primary (the school in st John’s Wood Marshall himself attended 40 odd years ago ) but this is where he is implementing, and experimenting with, his latest customized fitness regime. Shocked by the sight of flabby kids pouring out of London schools, Marshall is launching a campaign to get children out of their armchairs and into the sports hall and so hopes to fight the obesity epidemic that, by 2050, is expected to affect more than a quarter of British kids. Already he’s been compared to Jamie Oliver, whose crusade to eliminate the turkey twizzler from school dinner menus has heavily influenced government strate gies to counter obesity But where Oliver had fame, public sympathy and a TV crew at his back, Marshall has none of these things. So can he do it? In the past year childhood obesity has become a hot political topic. Across the population, said health secretary Alan Johnson last week, it represents “a potential crisis on the scale of climate change”, while British children risk a dramatic increase in obesity related disease such as type 2 diabetes, strokes and coronary disease, over the next 40 years. A recent report by the Commons Health Select Committee suggested that a generation of children would die before their parents if obesity was not addressed. Marshall, 50, identifies the usual reasons for the increase in childhood obesity preferences for junk food and sedentary, screen-based entertainment combined with a decrease in physical activity both in and out of school but thinks the solution is “actually very very simple”. “In London particularly, you can’t expect children to walk to school like they used to. The world has changed. It’s just not safe for them to play outside all the time either. But you have to allow for that and compensate for it by giving them more time to exercise in school – two hours a week the National Curriculum minimum, just isn’t good enough. So, the theory goes, you get them young with a basic fun exercise routine that can be incorporated into the school day, ideally for 30 minutes every day. At Barrow Hill last term, Marshall introduced a class of eight and nine year-olds to his “evolutionary movement patterns” – a daft name for a set of exercises based on the earliest stretching and wiggling movements made by babies and toddlers, which, claims Marshall, are vital for the body’s development. The work-out he has devised uses all different muscle groups just like an adult’s Personal training programme focusing on the waist and core strength. It doesn’t require equipment other than a few spongy balls so is relatively easy to implement. It can even be done in classrooms he says. Results include improvements in flexibility, strength, stamina and co-ordination. Marshall was himself a fat kid. “And I was really quite fat, more than chubby. Then I got into sport and lost it all until I wrecked my knee.’ A football injury at 16 ruined his chances of playing professionally and sent him into a spiral of depression. “I comfort ate and got quite fat again. I certainly know what its like to crave a fry-up, or eat a whole packet of Jaffa Cakes in one sitting. Marshall started his business at home in West Hampstead with “one set of dumb-bells from Argos”, training his mates and friends-of-friends, before landing a job with West Ham FC, where he overhauled the club’s fitness programme and worked with several members of the current England squad -including Rio Ferdinand – whom he still trains today. But he was never a puritan and claims that he relates to his famous, more rackety, clients because he doesnt judge their hangovers or tut at a lapse of discipline. 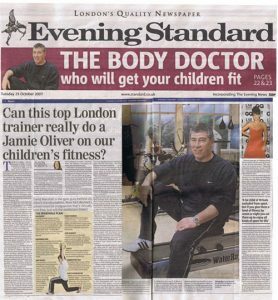 It’s partly because he worries about the fitness 1eve1s of his 8 year old daughter Millie that he wants all kids to be given more exercise at school But like Jamie Oliver (at least at first) Marshall has met with little sympathy from politicians. Last year, his methods were the subject of a BBC programme called The Body Politics, in which the scientist Baroness Susan Greenfield and 3 MPs- Meg Hillier, Mark Oaten and Shailesh Vara -were given the Bodydoctor treatment. All lost between three and six inches from their waists, and between one and three dress sizes (Marshall’s great claim is that he engineer a drop of three dress sizes or five to six inches from the waist in just six weeks). Yet no one in Westminster wants to listen to plans for school children “I went to the Department of Health and met civil servants to talk about childhood obe- sity, but it was a waste of time. All they did was ask me how much money I wanted.” Marshall thinks he’d need 300 trainers to teach the nation’s PE teachers his tech- niques, after which it wouldn’t cost a penny. Marshall says most exercise is boring unless done as a competitive sport. The challenge with his method is for children to understand how their body works. And the focus is also on fun, not punishment – the exercises have names like Wag Your Tail and the Hippie Shake. “Children don’t realise how hard they are working and how they are improving their balance;” says Marshall. A floor and a few squidgy balls are all that are needed for a 45-minute workout. The exercises include lunges, squats, balancing on one leg, stretching and using fitness balls to improve body balance. The aim is for children to gain physical fitness by the body working against its own weight. Children learn the exercises through a cascade technique – trainers show teachers the exercises, they instruct the children, who then mentor younger pupils. The children are also given a DVD of the movements to take home and teach to their parents. The exercises focus on the body’s mid-section, which is where children are prone to pulling on weight. The Marshall method is about building lean, healthy muscles and focusing on the waist area as well as the whole body. There are no climbing ropes involved or vaulting horses, so no getting friction burns or cut knees. Control and safety are the keywords, says Marshall. The children work in groups of three taking turns acting as instructor or pupil. This way they all feel they are participating instead of being left out, as in traditional team sports.